The final issue of Develop arrived today. I knew it was coming, but it was still sad to read the editorial. I've been reading Develop from the very beginning, and saved every single copy of it. They represent great historical record documenting the UK games industry from 1996 to, well, today. It's a bit late for it ever to have mentioned my name in its pages, but still, it reached its third decade before dying. I always liked Develop because it was actually for developers. OK, so later on it started to talk about marketing and other peripheral issues, but it remained about game development at its heart. 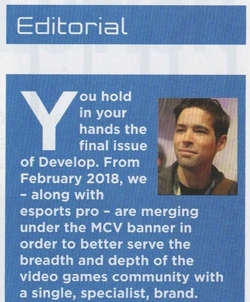 I don't suppose that merging it with MCV and esports pro will improve it. This means, of course, that I have an attic stocked with badly-stacked copies of Develop that constitute (as far as I'm aware) a complete set. They really should be in a museum or something. I'd donate them to the Essex University library if I felt they'd be going to a good home, but I suspect that the library would regard any offer on my part as tantamount to asking them to do my recycling for me, so I shan't bother. If you know any archive that might like them, though, let me know. So long as it's not going to cost me a fortune to mail them, you're welcome to have them. Ahh, I'll miss the old thing.